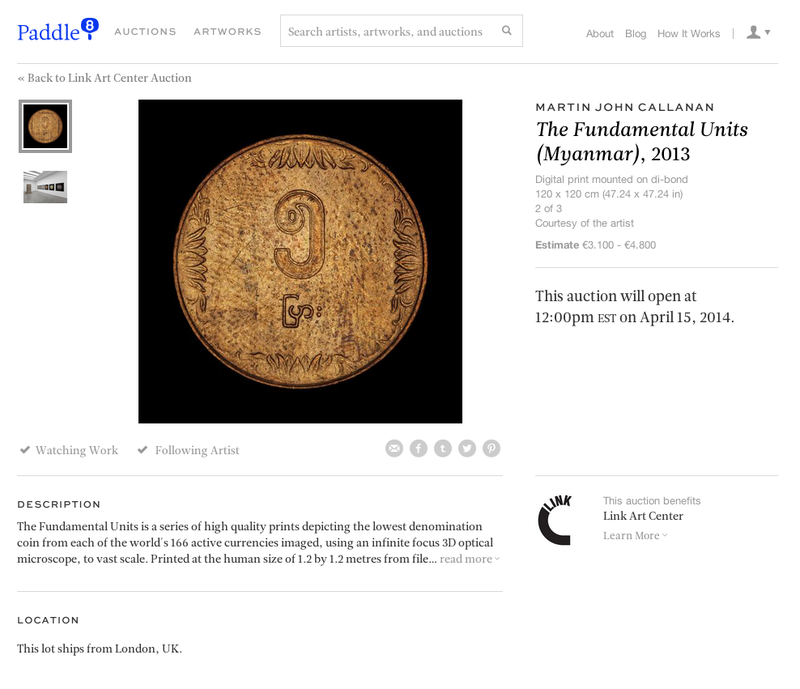 Born Digital is a benefit auction and an online exhibition made to support the activities of the Link Art Center on the online auction platform Paddle8. The event – the first with this focus taking place in Europe on this scale – will open on April 15, 2014, and will include more than 50 works kindly provided by 33 artists. For two weeks long, you are invited to bid on the works to support the artists and help us reach our goals. 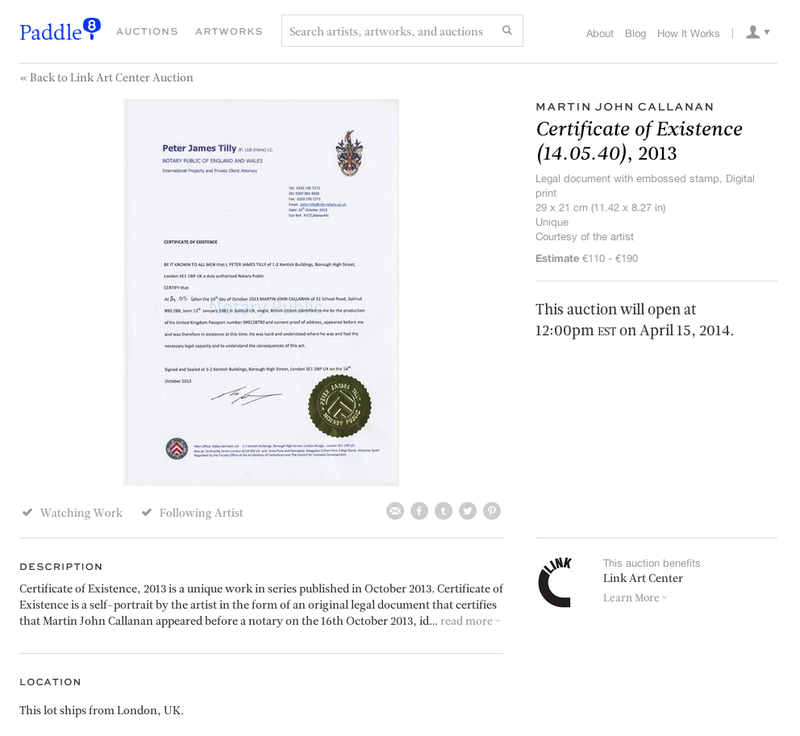 The Link Art Center is the first Italian organization collaborating with Paddle8, a web platform organizing monthly themed and benefit auctions, experimenting with the auction format as a means of self-funding. The complete list of participants includes: Alterazioni Video, Anthony Antonellis, Aram Bartholl, Erik Berglin, Enrico Boccioletti, Heath Bunting, Marco Cadioli, Martin John Callanan, Gregory Chatonsky, Adam Cruces, Caroline Delieutraz, Harm Van Den Dorpel, Constant Dullaart, Electroboutique, Herbert W. Franke, Elisa Giardina Papa, Matteo Giordano, Emilio Gomariz, IOCOSE, Joan Leandre, Jan Robert Leegte, Jonas Lund, Janez Jansa, Janez Jansa, Janez Jansa, JoDi, Eva and Franco Mattes, Rosa Menkman, Filippo Minelli, Vera Molnar, Jaakko Pallasvuo, Angelo Plessas, Evan Roth, Alexei Shulgin, Carlo Zanni. All the featured artists are either based or born in Europe. The selection includes different generations of artists working with the digital medium and within the digital environment, from early pioneers such as Vera Molnar and Herbert W. Franke, to net.art classics such as JoDi and Alexei Shulgin, to younger artists still in their twenties. The selected works display a wide range of formats, and respond in different ways – sometimes traditionally, sometimes more radically – to the issue of collecting the digital: prints, installations, drawings and videos are joined by animated gifs, websites, printable 3D files and 3D printed sculptures. Some of them display generative images, some others deal with desktop aesthetics; some refer to online habits, cultures and places, others are strictly related to the living and working conditions introduced by the digital shift. They all inhabit networked spaces; they are Born Digital. Starting prices vary from the very affordable (around 100 € for a video-in-print by Carlo Zanni or a Certificate of Existence by Martin John Callanan) to the higher prices reached by outstanding installations like Jan Robert Leegte’s Scrollbar Composition 2005/2011. If an artwork is sold, 20% of the final price will be used to support the upcoming activities of the Link Art Center. The LINK Center for the Arts of the Information Age (Link Art Center) is a multi-functional center promoting artistic research with new technologies and critical reflections on the core issues of the information age. Founded in Brescia, Italy, in 2011, the Link Art Center is active locally, internationally and online: it organizes exhibitions, produces artistic and curatorial projects, publishes books. To check out past activities, visit our website: www.linkartcenter.eu. The funds raised will be used to support our ongoing activities: Link Editions, our publishing initiative; Link Point, our project space; and Link Cabinet, our upcoming online gallery. The Link Art Center would like to thank all the artists, XPO Gallery (Paris) and DAM Gallery (Berlin) for their amazing support in this initiative.